Paella is a delicious rice dish from Spain that has become very popular and is now well known around the world. It originated as a peasants dish in the fields of a region called Valencia in eastern Spain and the Valencians prepared the dish with whatever ingredients they had at hand – rabbit, snails and vegetables. 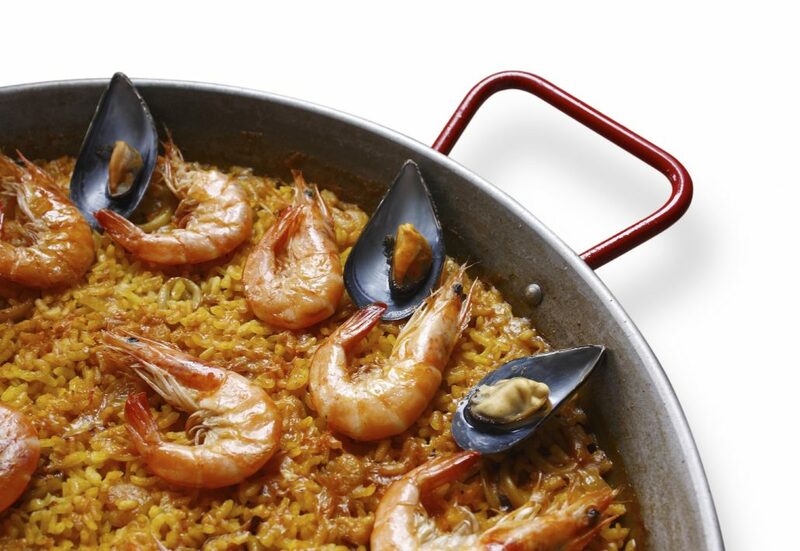 Today, Paella has spread to every region of Spain, using just about any kind of ingredient that goes well with rice! It is well known around the world and very popular as a dish because of it’s versatility. Want to see “Your Paella” in action? Watch videos here. What Goes Into Your Paella? We cook three different types of Paella – Mixed, Meat and Vegetarian. The Mixed Paella contains chicken, Spanish chorizo sausage as well as a range of shellfish including mussels, prawns, squid and calamari. Along with the meats and fish, red peppers, onions, paella rice, herbs, olive oil and tomatoes all go to complete the flavorsome dish! The Meat Paella contains all the same ingredients as the Mixed paella, but without the shellfish – instead, we add extra chicken and chorizo to give it a phenomenal taste! The vegetarian paella omits all meat and fish, and we add extra vegetables to the base paella mix. All the ingredients are added to our huge Paella pans and cooked in an authentic Spanish style, creating an amazing tasting Paella for you and your guests to enjoy. We only ever use the freshest ingredients in our Paella to ensure that authentic Spanish flavor, and to keep well within the food hygiene and safety standards! 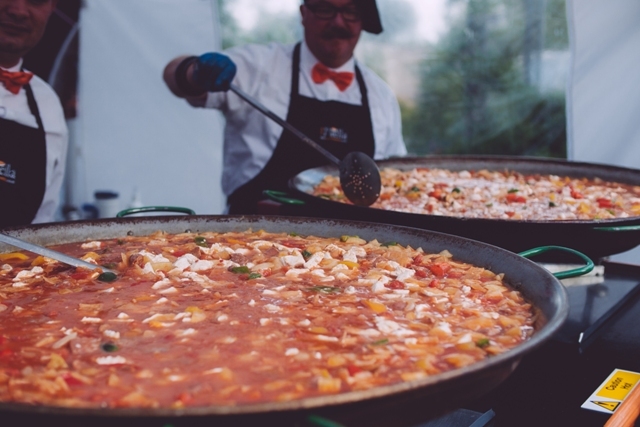 We cook everything on site from start to finish, which provides your guests with not only fantastic food, but a visual display of the cooking process along with the wonderful aromas of Your Paella, making your event one to remember! Spanish Chorizo Sausage in Red Wine as a Tapas for 150 guests. 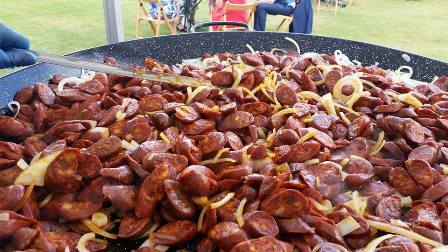 Our paella is not spicy, however if you are after a little extra heat we can use a spicier chorizo sausage! Just let us know your preferences and we can make your paella suit your tastes. What happens to any leftover Paella? Due to the nature of Your Paella we advise that any left over food be disposed of. The last thing we want is for you or any of your guests getting ill due to the food be left out for hours and turning bad. Do you provide salad or dessert too? We certainly can! We can provide salad, bread rolls, desserts and even starters and tapas for you to enjoy. Simply ask us about our additional extras when you call to book. Do I need to provide bowls and cutlery? We can provide all the bowls and cutlery you require. As standard we provide disposable plates/bowls and cutlery, however if you would like fine bone china plates/bowls and real cutlery, we can provide this too. Just mention it when you call to book and we can add this to your total cost.